When you think about our current economy you probably evaluate that we’re in a recovery period, a time in which the job market is slowly – very slowly – on the mend. You probably imagine employment rates on the rise, and would claim we’re faring considerably better than we were during the recent recession. And you’d be right. But for one group in our nation, this holds hauntingly, troublingly, untrue, and we need do our darnedest to figure out a solution because this is one important group of people: they are our future. 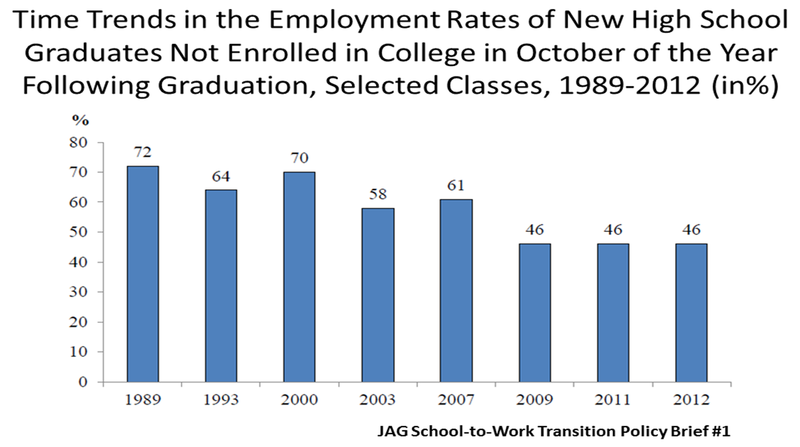 A recent report by The Center for Labor Market Studies at Northeastern University and JAG (Jobs for America’s Graduates) examines in detail the employment outcomes of high school graduates from the class of 2012 who did not enroll in college, and the results were not positive. Employment rates for our nation’s teens over the last several years (all demographic, socio-economic, and schooling groups) have seen steep drops. These drops have been so steep that employment rates for teens have reached new historical lows for the post WWII period. High school students and young high school drop outs have seen the greatest differences in securing paid employment (of any type) in recent years and young high school graduates , especially those not enrolling in college in the fall after graduation, have seen both declining employment rates and a strongly reduced ability to secure full time work. What’s concerning is the nature of these drops. Until recently the ability of America’s teens to obtain work has been fairly cyclical, with teen employment rates rising to above average during periods of job growth and falling during periods of recession. During the economic recovery of 2003-2007 however, teen employment rates did not see any significant rise, dropping from a rate of 70% in 2000 to 58% in 2003 and recovering only three points to 61% in 2007. Employment rates failed to increase again during the current job recovery from the recession of 2007-2009, dropping from 61% in 2007 to 46% in 2009 and holding there in both 2011 and 2012. These are the lowest employment rates for new non-college enrolled high school graduates in the U.S since the data series began being recorded in 1959. The employment rates of high school graduates varied considerably by gender and race ethnic group and across the board male high school graduates fared worse than female graduates, their employment rates dropping to an all-time low of 44% in Oct. 2012. Family income also influenced employment rates, with high school graduates coming from higher income families (no surprise here) seeing a stronger likelihood for employment. Another important note though, is that the ability of employed High School graduates not attending college to obtain full time jobs has also declined dramatically since 2000. This number dropped to 43% in October 2012, the lowest full time job share ever recorded in in this data series. The report combined the findings on the employment rates of non-college enrolled high school graduates with the share of the employed working full time to calculate their employment to population ratios, which are consistent with the declining employment statistics and darker still. In the month of October 2012 only 19 of every 100 high school graduates who did not attend college in the fall were employed full time, another historical low. As this study implores us, we need to think about the message and implications of these unemployment rates. Not only will this lack of employment adversely affect the future of these graduates in terms of lower employment rates, wages, and reduced training from employers, but it also sends the wrong message to youths still in school. How can we expect young people to understand the value of a high school degree, and support our claim that it’s important to stay in school, when their direct experience is observing the many idle graduates (their peers) with no employment and nothing to do? As of now, no new policy initiatives exist to address this large-scale labor market issue. So it’s up to us. What are we going to do about it? This was a very popular post from April, 2012. The data is pretty much the same. And it bears repeating. Managers and supervisors (especially in the Baby Boomer cohort) in almost every type and size of business have been known to lament the lack of loyalty and so-called business savvy in the Millennial generation. Achievers and Experience Inc. fielded their annual survey of graduating college students in January. The data are eye opening. So, OK. This has got to be their youthful exuberance and relative inexperience speaking, right? Well, I wonder if that really matters. And employers need them to stay a whole lot longer than 1.5 years! So what happens between “I expect to stay with my employer for 10 or more years…” and “…after one year with the organization I’m leaving for a better opportunity”? I think we all know that answer to that question. These data are a wake-up call for employers. It’s a message from our talent pipeline that they really do want to engage with us; they believe our employer brand marketing messages; they want to learn and grow with us. It’s time to listen harder and make sure our employer brand messages aren’t experienced as bait and switch tactics. I don’t know about you, but I’d hate for the Millennials to have such negative employment experiences at the beginning of their careers that they opt out of organizational life altogether before they’re 30. We’d really be in a pickle then! If you had one piece of job search advice to share with college seniors who are entering the job market in a few months, what would it be? I’m working with a large group of college seniors next week to help them focus in on their career planning and job searches. These are liberal arts students with likely majors in business, communications, the sciences and English lit. What’s the one thing you’d tell them as they gear up for their job searches? Please leave a comment below. Thanks!